It’s a wonderful movie, truly. It’s a Wonderful Life. One of my personal favorites, actually. And a personal favorite for many, especially as a TV staple at Christmas, thanks to its lapsed copyright in 1974 (although that was successfully challenged in 1993). The director, Frank Capra, is in top form, as is James Stewart, who displays devastating depth as George Bailey, an ordinary man who aches to be extraordinary. Both deservedly earned Oscar nominations, out of 5 total, including Best Picture. In the film’s nightmarish second half, George gets a rare second chance to see how life would have been without his presence — a concept that’s been seen time and time again, but it still feels fresh and raw every time I rewatch this movie. And I still find tears in my eyes toward the end when everyone chips in to save good ol’ George Bailey, and when James Stewart whispers, “Attaboy, Clarence” and winks after the bell rings on the Christmas tree. Oh, who am I kidding?! I’m tearing up right now even typing about it! But…. how do you solve a problem like Mary? 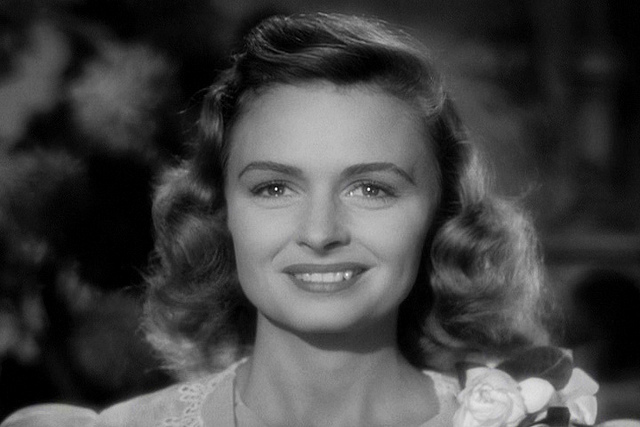 Mary is George’s wife and one true love, played with intelligence and warmth by Donna Reed. We see lots of her in the film’s first half, through childhood adventures and young adulthood until George finally realizes he’s in love with her. Throughout these scenes, she is quite lovely and open and trusting and displays a great sense of humor. She is his equal in every way. And she MUST be believable as his one true love in order for the second half of the film to work, because what she becomes is the straw that finally breaks George. Throughout the nightmare he witnesses in the second half — his brother dying, his mother withdrawing into a bitter old woman — it is the scene with his wife that finally gets to him, that breaks him. And what does Mary become if George is out of the picture? A Spinster Librarian! Sigh. Mary in the first half of ‘It’s a Wonderful Life’ (1946). This screenshot from the film is in the public domain. 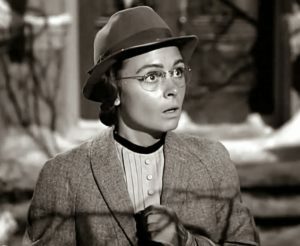 Mary as the Spinster Librarian in the second half of ‘It’s a Wonderful Life’ (1946). This screenshot from the film is in the public domain. In the first half, she looks lovely. Modern hairstyle, flattering clothing, fresh and clean. But without George, she suddenly loses her sense of style?! Glasses, sensible clothes, hat, hair pulled back, gloves, no makeup. She is so covered up, almost hiding, with the hat and the gloves and the buttoned-up clothes. This image is the stereotypical prototype for all Spinster Librarians. This does make sense, as the Spinster Librarian is one of the character types that heavily rely on stereotypical visual cues: the severe hairstyle, glasses, and prim clothing. But worse than that is the change in Mary’s personality. In the first half, she is warm and funny and sweet. In the second half, she has become shy, furtive, non-trusting, and scared of men. A typical Spinster Librarian, right? (Sigh.) Mary clutches her purse, and finally screams and faints when he declares her to be his wife. What’s so disturbing about this scene — again, only about 30 seconds long! — is the uncomfortable undertones of this scene (at least for librarians). That without men in our lives, the ultimate nightmare for women is… to become “old maid” librarians?! That if we get married, we are spared from this oh-so-terrible fate? Again, sigh. I know this scene is taken to extremes for the sake of the plot. George is near breaking point, and he needs a shock to get him to appreciate life again. And Mary becoming an “old maid” highlights the point that they are each other’s true loves — that without the other, they are not truly whole. Plot-wise, this scene makes sense. But emotionally, as a librarian, it is hard to swallow. So this movie will continue to be a personal favorite — but a personal favorite with an asterisk. It’s a Wonderful Life. Dir. Frank Capra. Perf. James Stewart, Donna Reed, Lionel Barrymore, Thomas Mitchell, Henry Travers. RKO, 1946. Author JenniferPosted on September 21, 2011 April 8, 2019 Categories Class I, Public librarian, Spinster LibrarianTags Public library2 Comments on ‘It’s a wonderful’… stereotype? Where do I begin? A love story. Welcome to my new site about librarians in film! For me, librarians + movies = love! Technically, this site is a new (and hopefully more permanent) incarnation of my previous “Reel Librarians” site, which I had developed off a previous work site and server. But the site’s back now – hopefully, better than ever. Please check back often or sign up for RSS or email updates. So where did my interest in reel librarians begin? I am a proud second-generation librarian — my mother is a (retired) school librarian. We should have both known I would become a librarian, because when I was young, I took (many) stacks of index cards and made a card catalog for my own personal collection of books and magazines. FOR FUN! And I literally grew up in a library — my parents had 5 library collections within our house: 1 for children’s books, 1 for fiction, 1 for non-fiction, 1 for biographies, and 1 for movies. We lived in the country, with only one TV channel available. Therefore, I grew up watching movies! So this site, connecting librarians and movies, is a perfect combination of what I grew up on and loved — and I hope you will enjoy it a little bit, as well! Author JenniferPosted on September 19, 2011 April 8, 2019 Categories Blog faqs, stats & facts12 Comments on Where do I begin? A love story.